On this day, Elvis is performing his last show in a series of four sold-out concerts at this venue, much like he did just over a year earlier 32 miles away in Manhattan at Madison Square Garden. The audience was primed beyond measure as Elvis had not performed in the New York-tri state area since the previous year. 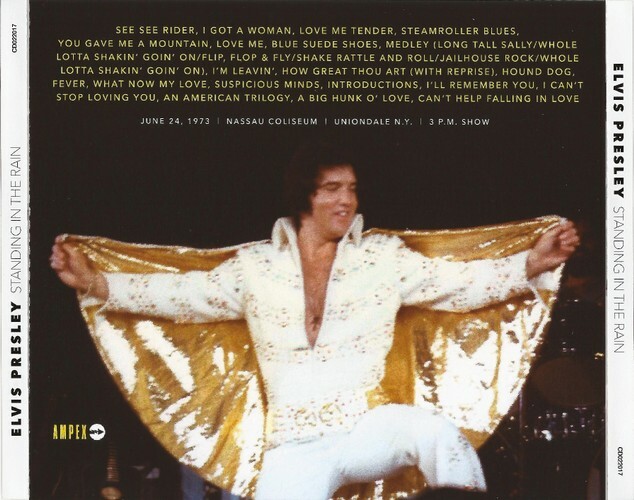 The setlists at these shows were similar to the recently aired ''Aloha From Hawaii'' TV Special, with several variations, most notably a classic rock 'n roll medley, How Great Thou Art, and I'm Leavin'. This show was previously released on the MxF title ''Uniondale Hysteria, Final Day'' from a much inferior and different tape. We at Ampex found a brand new source, the sound of this recording replicates exactly what the fans in the audience heard that night. It was recorded on high quality BASF tape,and has tremendous dynamic range considering the limitations of amateur equipment in those days. It captures the sound of Elvis's show that evening in clear and brilliant sound... and we advise you to play this loud and proud, and you will feel like you are right there in attendance. This release is mastered directly from the original first generation audience recorded cassette,which has been carefully preserved in it's vintage hard plastic case for 40 years. The CD will also feature a 16 page booklet, including rare photos of Elvis in Uniondale, and liner notes! Ask your dealer for samples!